Hey all. Back from a bit of a vacation. Kids were at camp so I tackled a project that has been on the to do list for a LOOOOOOOOOOOOOONG time. With my mother’s help, I recovered some seriously sad dining room chairs. When the hubby and I moved into our first home, we inherited a nice Ethan Allen dining room set. The covers for the chairs were well worn already and made of a traditional dining room material (**read pretty but not functional for having 4 kids!) Eventually, they met their cushion demise and the chairs were relegated to the basement until we could afford to have them re-upholstered. Well, the dining room chairs never really hit the priority list, until now. As we work toward fixing up our house to sell, the chairs needed to make a reappearance in their rightful place. But as you can see, the cushions were well past their prime. My mother suggested I bring the cushions over to her house and that we fix them up ourselves. This seemed a daunting task but my mom had done it to her own chairs and was confident we could figure out this mess too. So down the road I went! Protective eye wear and gloves are recommended as well. If cushions are really old, consider doing this task outside as the dust accumulated inside the chairs from deterioration was quite a bit. On the underside of your dining room chairs, locate the places to unscrew the seat from the wooden chair itself. If this is an option, you will be able to proceed with this tutorial. When ready, remove all screws to separate the seat from the chair. Carefully measure the seat depth and width, making sure to measure both the captains seats (chairs with arms) and chairs without arms separately as they may be different. Head off to the local fabric store and select a fabric for your purposes. For our chairs, we selected a duck fabric which actually is a type of canvas. I was so happy with the choice of options since I was looking for something more durable and certainly water and stain resistant. I picked up a fabric spray as well to ensure that we had all bases covered. While there, you will likely pick up your new foam as well if needed. JoAnn Fabric had all of the things I needed in one location which was great. The fabric only store we stopped at originally did not. In fact, when we told the owner what we were doing, she promptly sent us on our way saying she had nothing to help. Go figure. As the staff at the store if wash before use is recommended for the fabric you choose. Some fabrics shrink! 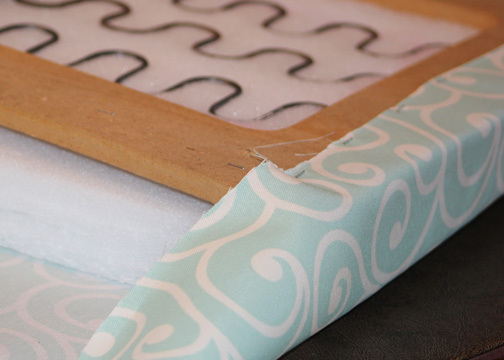 When purchasing fabric, be sure to consider the depth of the foam you have purchased. You can squish it down a bit but better safe than sorry. If you are unsure how much you need, chat with the person helping you to get the fabric at the store. They are so helpful and measure for projects all the time! 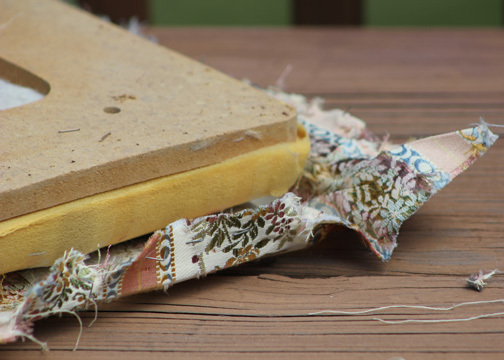 Once you have all supplies on hand, you will need to rip the old stuff off your cushion. This was quite a task! There were no less than 75-100 staples in each cushion. There were also 3 layers of material secured to the bottom including a dust cover, a piping band and the cushion cover itself. At first we attempted to use a staple remover, then we attempted to use a flat head screwdriver to pry the staples up. Both of these options proved difficult for us so we went to pliers. Using the fabric as the leverage, I was able to pry the staples out along with the fabric while holding the fabric with the pliers. I was able to accomplish the same with my hands though this was a bit tough. My father was of course able to come along and pull each staple out using the pliers in no time at all. Either way works though I have to say my way was faster. (Sorry, daughter satisfaction showing 😉 ) Be sure all stray staples are removed so you do not rip your new fabric! As you remove your layers, take note of how they are assembled, especially at the corners. Using chalk, trace your new foam if replacing. 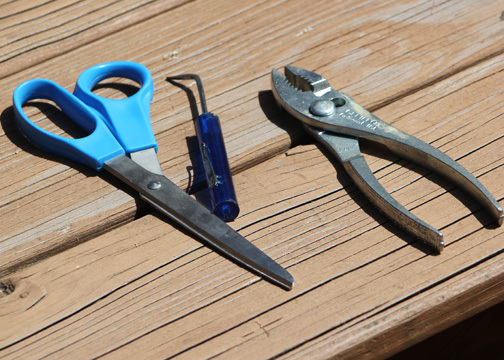 Cut to shape using scissors or a straight blade. If you have a long piece of fabric, be sure to divide the piece according to the number of chairs you plan to cover. I was redoing 4 chairs so the piece was divided into four. Cut into appropriate sections. Re-assemble chair cushion, upside down on the wrong side of the fabric piece. 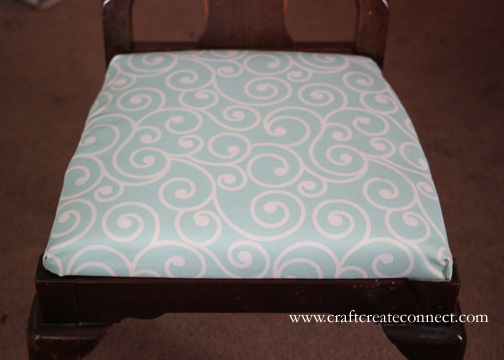 Be sure to center on fabric piece to allow all sides of the cushion to be covered with the fabric. Using either a weight, a heavy book, your knee or hands, press down evenly onto cushion bottom to squish the fabric a bit (as your body weight will when sitting on it.) 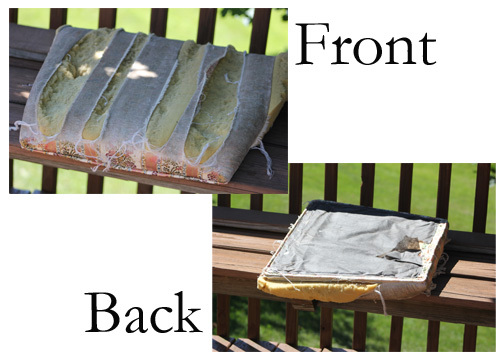 Fold the fabric around the edge and staple onto bottom, keeping the fabric evenly taught. Staple front first and then back. With pressure still on the chair, begin to pull the fabric around the corners of the chair, gathering and stapling a bit at a time. The duck fabric was a bit thick to gather in small amounts so we ended up folding it similarly to wrapping paper on a present. Pull up along edges and staple one side then the other. Cut off excess fabric and voila! I have yet to replace the piping layer around the chairs but may do that in the not too distant future. I was sure to spray with the fabric spray as soon as they were done and have already put it all to the test against some chocolate covered little fingers. The chocolate blotted up without a trace! YAY! I encourage you to try this or another DIY make-over sort of task. It was not as terrible as I thought and given the appearance of the chairs, I really had nothing to lose. The total of the materials for 4 chairs, using a coupon (and while it was all on sale!) was only $50. If this non-seamstress can do it… so can you!!! Definitely saving this. We got some lovely dining room chairs with white fabric at a consignment store. They are now looking a bit sorry with two kids. So at some point they will need a facelift. I totally understand what you mean! Hopefully this with inspire you to give it a try! 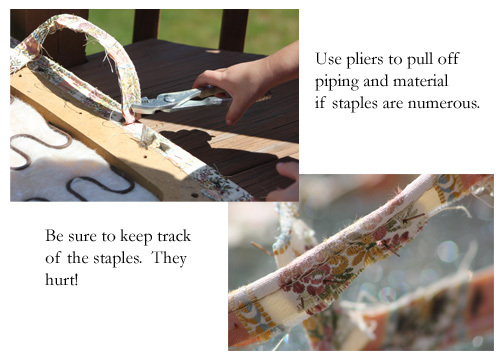 This is a most excellent tutorial – I shall attempt to pin it for my future reference…… I have re-covered dining chairs once before a few years ago, but hit a major snag as I was pulling apart the last chair seat – the very last screw was jammed and WOULD NOT come un-jammed. So with every thing else lying on the floor and sweat on my brow my only option was to work around the recalcitrant screw. Consequently one dining chair is very obviously a ‘botch job’ as we say down here! Pleased to report I successfully pinned you! Wow! That was easier than I thought. Those chairs look beautiful. Thanks for the instructions! It was easier than I thought too! 🙂 You are very welcome! Your work is really remarkable. I was also thinking of redesigning by dining room, but could not get started with it. Your story is really helpful and inspiring for me. Thank you so much Sarah! You can TOTALLY do it!